Mangaluru, Mar 22, 2018: The arterial roads in Mangaluru, heve one speed breaker at an average interval of around 300 metres. Over 74 of them dot the 21-km four-lane arterial roads. 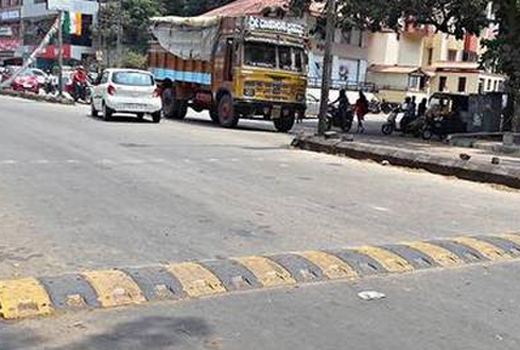 Mangaluru City Traffic Police recommends putting up speed breakers depending on traffic density and vulnerability of the location to accidents. A local daily undertook a survey on March 21, Wednesday following frequent complaints that especially plastic speed breakers not only bring vehicles to a complete halt but also puts the riders to extreme discomfort owing to their rough surface. While the Indian Road Congress Code 99-1998 recommends that speed breakers may be installed only on minor roads at their intersections with major roads, all speed breakers erected by the MCC on traffic police’s recommendations are on main roads thereby slowing down vehicular movement in the core city. Traffic rules mandate that drivers must exercise caution before entering main roads from cross roads. However, the ground reality in Mangaluru is just the opposite. While vehicles from cross roads zoom onto main roads, those moving on the main roads are forced to wait because of innumerable speed breakers, rued citizen users. Plastic humps : The IRC Code 99-1998 mandates that every speed breaker should be a rounded hump with 3.7 mt width and 10 cm height facilitating desired speed restriction of 25 kmph. It also says that the speed breakers should neither damage the vehicle nor inconvenience the driver/ rider. Contrary to this rule, plastic humps are installed at many places, which according to orthopaedics in the city, are dangerous to spines of road users. Additional Director General of Police (Crime and Technical Services) and in-charge Road Safety Commissioner, M.A. Saleem told media that speed breakers should conform to IRC standards. Plastic humps are strictly a no-no on public roads as they slow down vehicles, he said. Speed breakers should normally be erected on cross roads at their junctions with main roads and not vice versa, he added. City Police Commissioner T.R. Suresh said speed breakers are recommended only when absolutely necessary, and he would have re-look into issues of erecting them on main roads and the use of plastic humps.